Adult Coloring Book Art Supplies Storage Solution #1 I never dreamed that I would have a problem with Adult Coloring Book Art Supplies Storage. When I first joined the adult coloring book craze I bought a cute bag for storage. 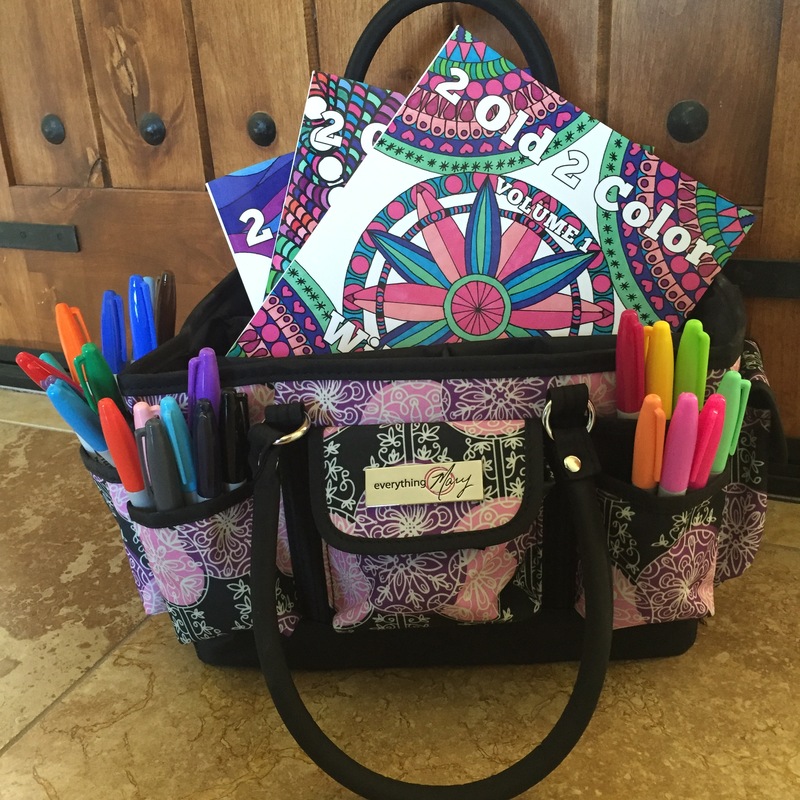 This JBonest Bohemian bag could hold three or four coloring books and all of my markers. The bag was colorful and stylish. I thought it was the perfect solution. And it was. For a while. But then I bought more markers. And more books. And more markers. My bag, however colorful and stylish, could no longer hold all of my markers and books. I decided to keep the coloring books in the bag and get another bag for my markers. Adult Coloring Book Art Supplies Storage Solution #2 I bought a medium sized Everything Mary Organizer and was certain that I now had the perfect solution. 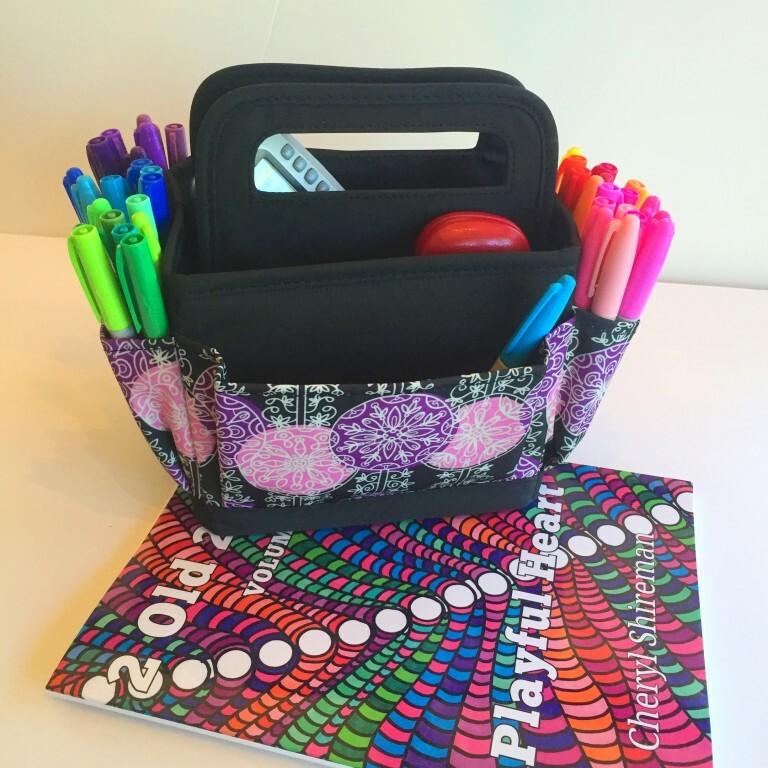 All of my coloring books could still fit in my JBonest bag and all of my markers were organized in the Everything Mary Organizer. I had plenty of room to organize my markers by color and they could be stored with the tips down (best for ink flow). Perfect! But then….yes, you guessed it. More books and more markers. Lots more markers. I’ve always been a Sharpie fan but once I discovered Bic Mark-It markers I fell in love with them too and my marker collection grew and grew. 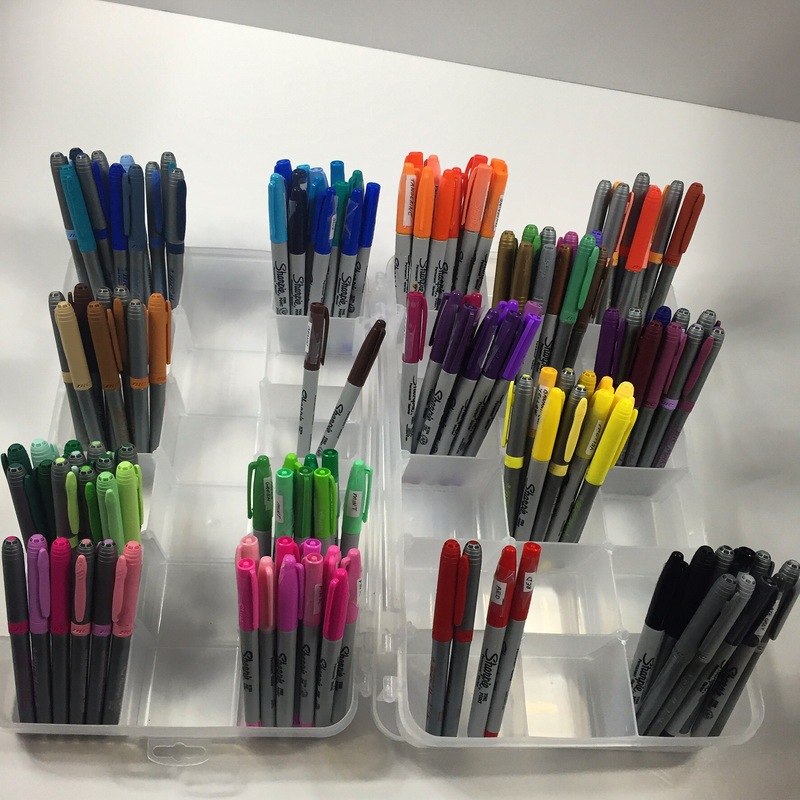 In addition, with so many markers, organization became even more important. Adult Coloring Book Art Supplies Storage #3 So I bought a Large Everything Mary Organizer. I liked this bag a lot. My only problem was that the markers didn’t stand up inside the bag quite like I wanted them to. I bought some disposable plastic cups (from WalMart) and used them to divide the markers inside the bag. This worked for a while but I didn’t like that I couldn’t see the markers very well when they were all stored in the bag and divided into the plastic cups. Adult Coloring Book Art Supplies Storage Solution #4 Then I gave up on the bags and bought some plastic see through Akro-Mill storage cases. I love these storage cases because they have little removable plastic inserts and you can create storage areas of varying sizes. First, I tried storing the markers lengthwise and flat in the case. That worked for a while, but again, I had too many markers and I had to use two cases which entailed opening and closing the case lids a lot while coloring. Then I decided to try and store the markers upright so I removed the lids from my storage cases (they pop off easily), inserted all of the dividers and stood my markers upright in each divided area. That sort of worked but the markers kept tipping over onto the other markers and that bugged me. 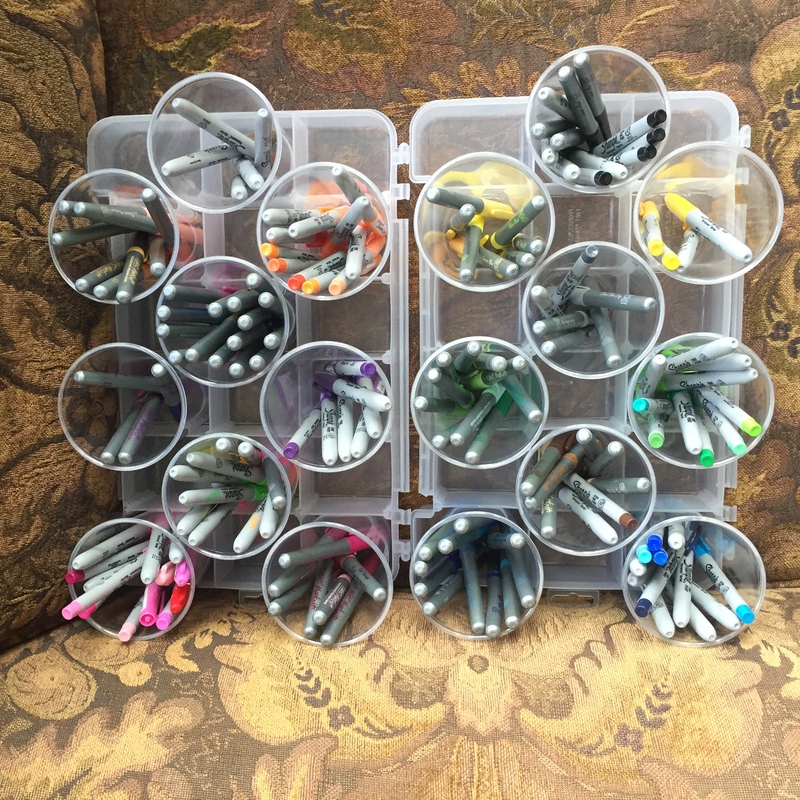 Adult Coloring Book Art Supplies Solution #5 Finally, one day I came up with the perfect solution – I placed a plastic disposable cup into every other compartment (every compartment felt too crowded) and then sorted my markers by brand and color. Now, I can store the markers with the points down and still easily see and identify colors. 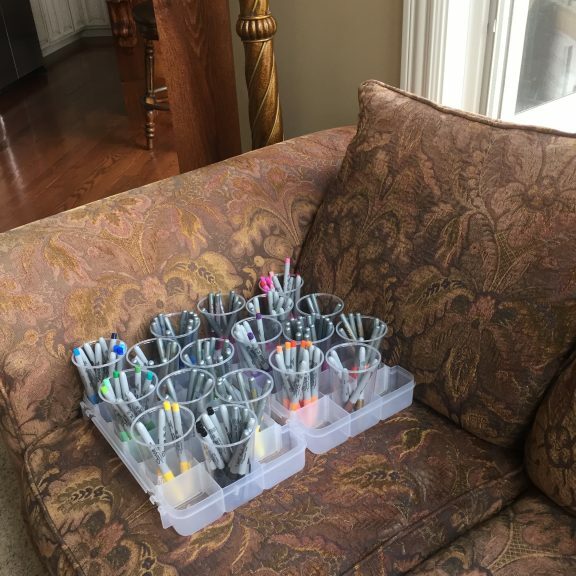 I can also easily place both of the storage cases on the couch cushion next to me while I am coloring and see all of my markers at a glance. It is a perfect solution for me. All I had to do was remove the lid from perfectly good storage cases and buy some disposable cups from WalMart. But, hey, it works for me. Right now, this is the perfect solution for me. I store extra markers in my Large Everything Mary bag, sorted into plastic Ziplock bags by color. 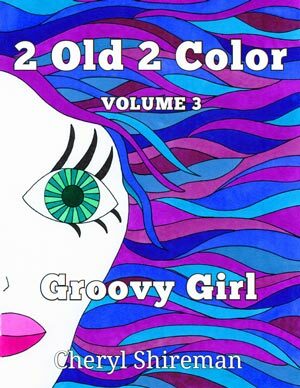 I use the medium-sized Everything Mary bag for storage of various art supplies I use in creating my 2 Old 2 Color series of adult coloring books. 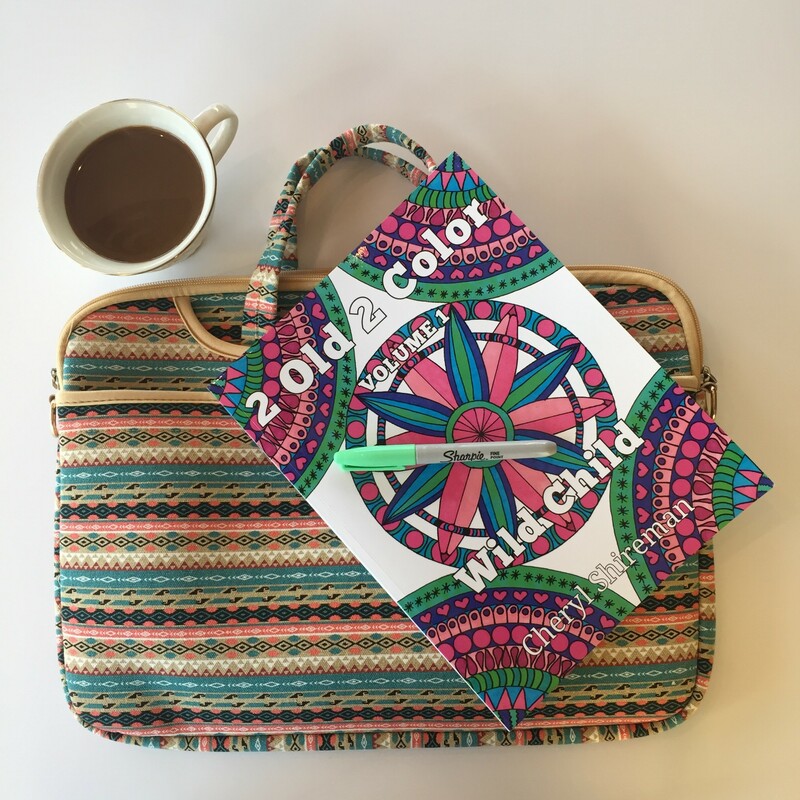 When I travel, I throw a couple of books and some markers into my JBonest Bohemian bag and I’m ready to go! So, none of my previous storage and organization solutions have gone to waste. All of them are being used. Your storage needs probably aren’t the same as mine. If I had not started creating adult coloring books and reviewing art supplies I probably could have stopped with that first JBonest Bohemian bag. In fact, I bought that same bag for both of my daughters and they store their adult coloring books and markers easily in their bags. 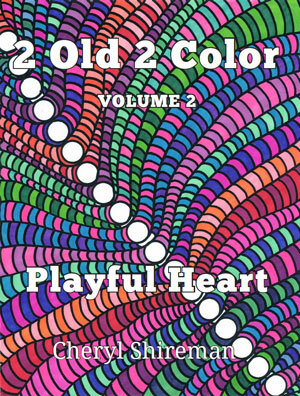 But then again, they aren’t obsessed with adult coloring books. Ha! 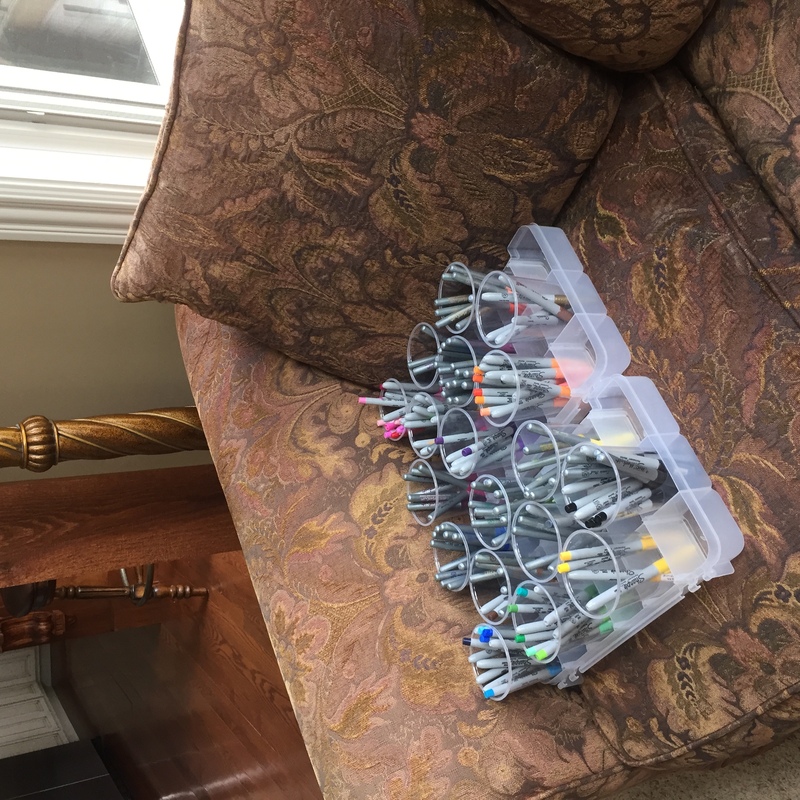 Whatever your storage needs are, whether you are obsessed or not, I hope this blog post will help you to store and organize your markers and coloring books in a method that works well for you! Happy coloring! Lol, I’m in big trouble, kinda sounds like me. I have a pencil problem! I can relate Michelle! I have a marker problem. Ha! Cheryl, I am so glad I found you. 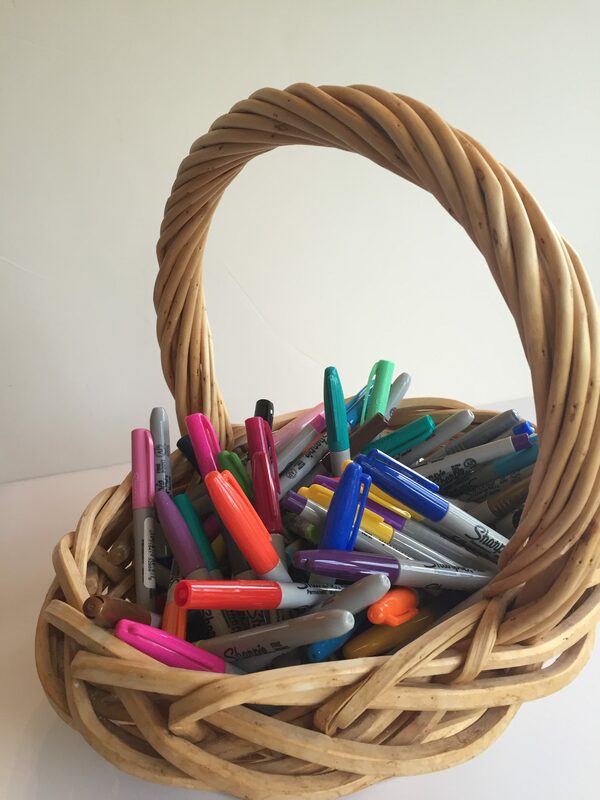 I’ve been reading up on your varies posts about Sharpie Markers/Bics…Now the storage! I have sooo many Sharpies, just wish I had started with the prior limited editions. I have the 3 now available, times 2 sets each! for backup when I run out of a fav color. 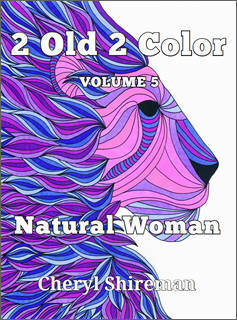 Same with the 5 pack of the Limited colors. Yes, I am addicted to markers and coloring. I am a hoarder! I’ve gone through multiple storage containers for my Copic markers several years ago, but just have my sharpies laying flat. You mentioned that ‘tip down’. That makes sense, now I’m looking in my containers like your clear ones, and see if they work. If not, I’m off to WalMart tomorrow. Thanks for ALL your information! I am thinking/working on a labeling solution to the markers, with a color chart with a “NUMBER” and the names, thanks to you, and use a small label sheet with the name and number typed in (I hope), and then scotch tape it to the cap. I did that with another set of markers Zig Clean Color Markers, and it worked out great. I DO NEED a colored out chart of every marker/pencil that I use. 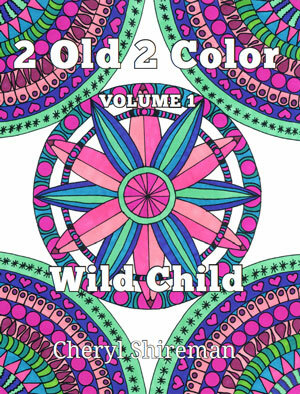 And I am an addict to coloring books. Have to figure out how to store them! I would love to know how your labeling turned out Sue. I’m always looking for the perfect solutions for labeling and storage. 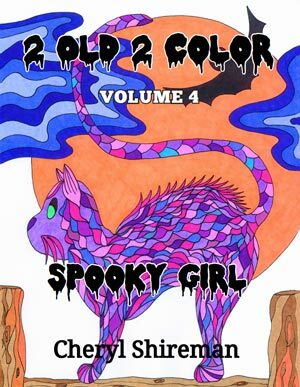 Happy coloring!